Be refreshed with this delicious lemonade strawberry slushie. Find out how to make your very own sugar free slush recipe at the convenience of your own kitchen. On a hot summer day, I searched and craved for something cold and sweet to cool down my 8 month pregnant body. I am trying to avoid the calories, sugars, and chemicals of other dessert shakes or sodas. A dear friend of mine had just stopped by with a flat of freshly picked strawberries. You know... the fully ripened berry just melts in your mouth. You hardly have to use your teeth. Delicious! 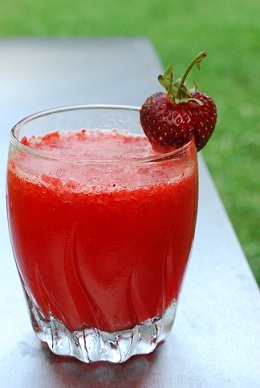 I know that freshly picked strawberries are not always available... so in the following slush recipe, use the freshest strawberries you can find. I wanted to try blending a handful of my FRESH berries to enjoy their flavor in an unique way. The ice cold slush creation that came from those delicious little berries was just delightful! Here is how I made it. I sure do hope that you enjoy it just as much as I did. Happy blending! * I usually make freshly squeezed lemonade once a week. My favorite lemonade recipe is: 1 quart water, juice of 3 lemons, 1-2 tablespoons white steiva powder (NuNaturals Brand). This tasty lemonade recipe is sugar free and contains hardly any calories.